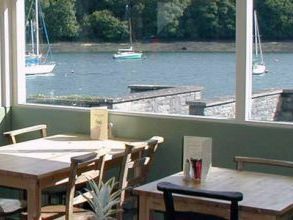 Quayside is a multi award-winning tearoom set in the heart of the National Park, with a reputation for serving the best of local Pembrokeshire produce, in an idyllic waterside setting. Simple sandwiches & freshly baked baguettes rub shoulders with Roast Lobster, Wild Mushroom Tart, Smoked Mackerel Pate & great local Crab. Our freshly baked cakes and desserts all made at Quayside each day, are not to be missed. Pitchers of Pimms & Sangria, freshly ground Welsh/Italian coffees, specialty teas, Welsh Cider and local Beers. All this is served in an unfussy manner with style, attention to detail and with good manners. 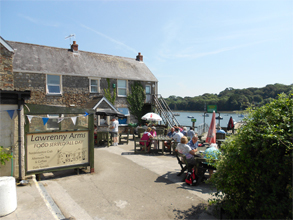 Enjoying a fabulous waterside location, perched on the bank of the Cleddau River, the Lawrenny Arms (or Doghouse as it has been affectionately known by generations of local people), enjoys one of the finest locations in Pembrokeshire. The broad sweep of the estuary runs east in two spectacular branches towards Cresswell Quay and Carew Castle. Not only is the Pub a popular spot for yachtsmen, enjoying the peace and quiet far up river from busy Milford Haven, but locals and visitors alike travel via the wooded back lanes to enjoy the tranquility of Lawrenny Quay. 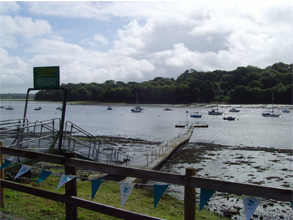 Lawrenny Quay has had a pontoon constructed by their experienced staff to allow thirsty mariners direct access to the pub at most states of tide. Just tie up your vessel to sample one of our home cooked meals and taste our local ales. Children are welcome.